I was invited to tag along with MB Maher on one of his garden photo assignments, this time to get some preview photos of the garden of artists Andreas Hessing and Karen Bonfigli, which is one of many to be featured in the upcoming Pacific Horticulture symposium to be held this September 23rd through the 26th, Gardening Under Mediterranean Skies. 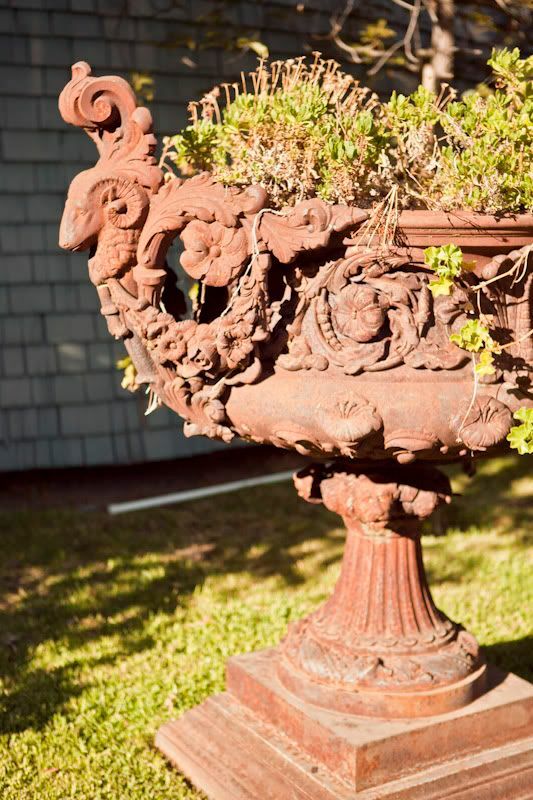 This antique, Old World urn, however, is not from the Hessing and Bonfigli garden. 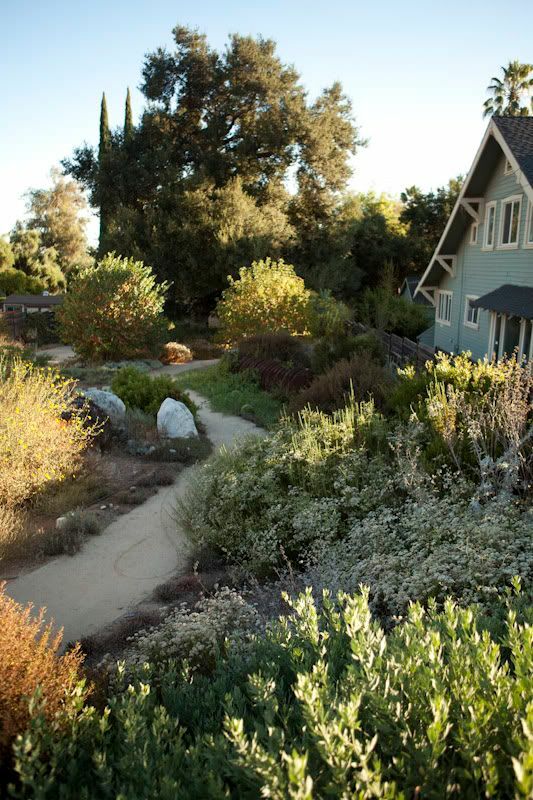 There was a bit of a detour before we arrived at the Hessing/Bonfigli garden, a garden which illustrates sustainable land practices using mostly native and edible plants. It all started, improbably enough, with a U-turn through the Theosophical Society’s headquarters, a religious group founded by Madame Blavatsky in the late 1800s, one of the quasi-religious societies that proliferated in late 19th Century California, alongside other fortunes to be made in railroads and oil. My only knowledge of this society came through a spiritual writer I read in my adolescence, Jiddu Krishnamurti, who broke away from this society as a young man. It’s groups like the Theosophists who give California its enduring reputation as a destination for the intellectually and financially restless. (Some might uncharitably prefer the term “lunatic fringe.”) It was a shock to inadvertently wander into the enormous property related to a group that I thought had faded away into obscurity. Not at all. 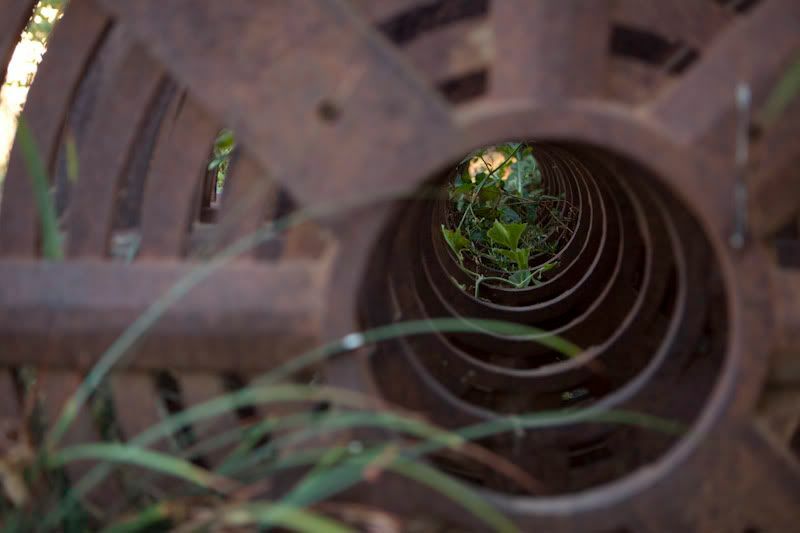 The present accesses the past through rusty iron gates wide enough to drive through. As we exited the Theosophical Society property, a towering cupola rose into view across the street. We were a half hour early for the photo shoot at the Hessing/Bonfigli garden, so we parked in the gravel shoulder in front of the house next-door to see if we could get a few photos of the enormous Queen Anne mansion with the cupola rising several stories high. As I stood in the gravel waiting for MB Maher to gather his things, a gentleman from the house next-door, accompanied by a bouncy, white Pomeranian, eagerly approached me as though I was on time for an appointment. Flummoxed, I started asking about his well-behaved dog, and when I’d exhausted that subject, began some small talk about the mansion looming over his own small house. Without missing a beat, he offered to give us an outside tour of the historic property he’d lived next-door to for 20 years, the owners being away that evening, and led us through a narrow opening in the tall hedges that marked the street-side boundary of the property. Obeying no other logic than that of a dream, we followed him onto the property. 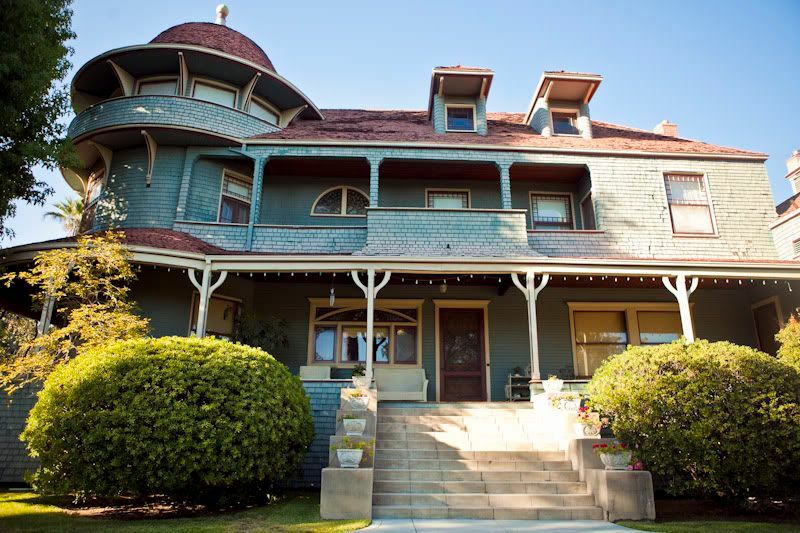 “The Andrew McNally House is a two-story house designed in the Queen Anne, Shingle style by master architect Frederick L. Roehring. The house was constructed in 1888 and in 1894 the one and a half story Smoking Room was added to the southeast corner of the house. 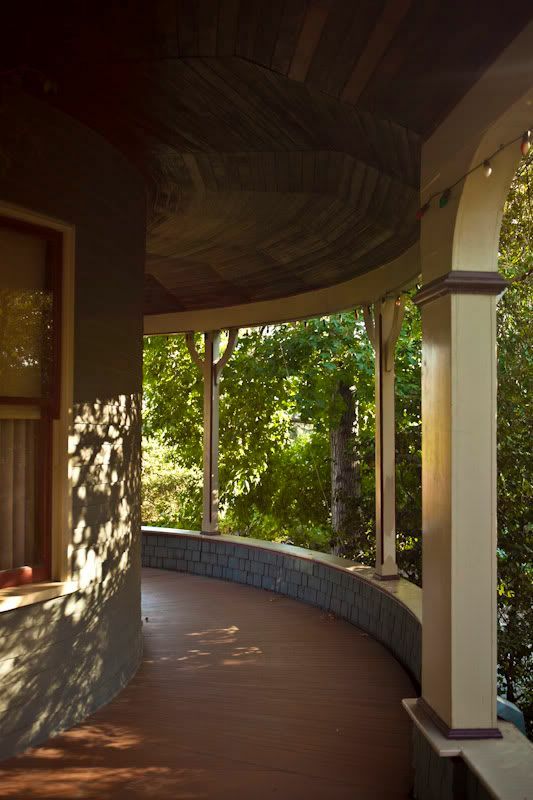 The house features a spacious front porch; circular tower capped with a bell-like roof; sash windows decorated with small perimeter panes or stained glass transoms. 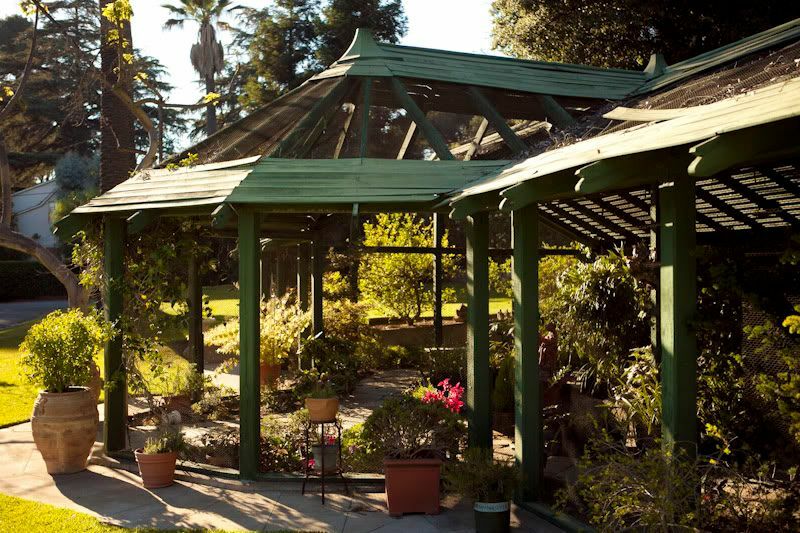 Included in the boundaries is an 1895 aviary that is now used as a covered patio and conservatory. 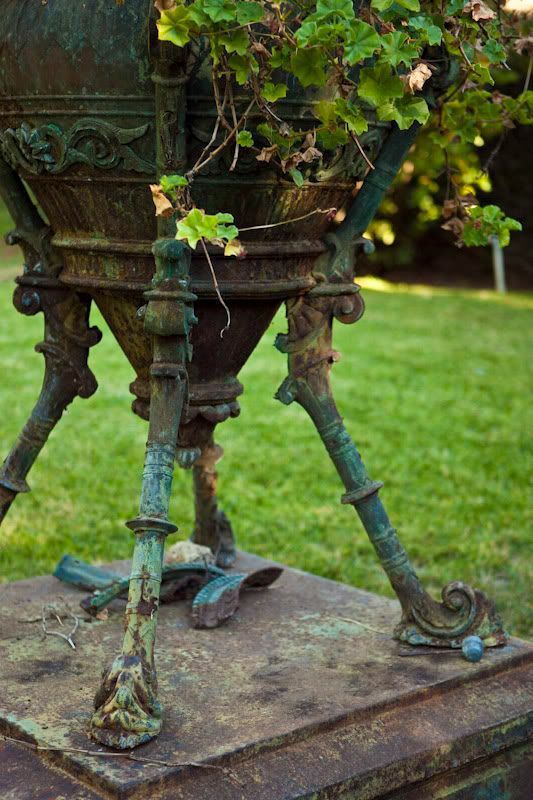 The grounds also feature two original urns. Below is the abandoned aviary, though my guide was not familiar with this use of the structure. I read today that the birds escaped as the property fell into decline before being restored in the 1950s. In an endless labyrinth of six degrees of separation, architect Wallace Neff is the grandson of Andrew McNally. The curve in the porch where Smoky, the Pomeranian, startled us all by jumping off the porch into a small tree, then landing 12 feet below. I screamed. The dog was fine. All of which fit seamlessly into the dream-like atmosphere of this little adventure. We left our guide into a glimpse of extravagant, resource-intensive estates of billionaires past, waving goodbye with Smoky in his arms, and headed for our real appointment with a new, sustainable vision of the future a few blocks away that embraces the plants newcomers to California centuries ago quickly replaced with exotics. The gabion fence marks the entrance to the garden started in 2004. The massive oak in the distance was carefully incorporated into the new landscape, sequestered from excess moisture by dry-laid paving running the length of the property to the back vegetable garden, all on land that was formerly olive groves. 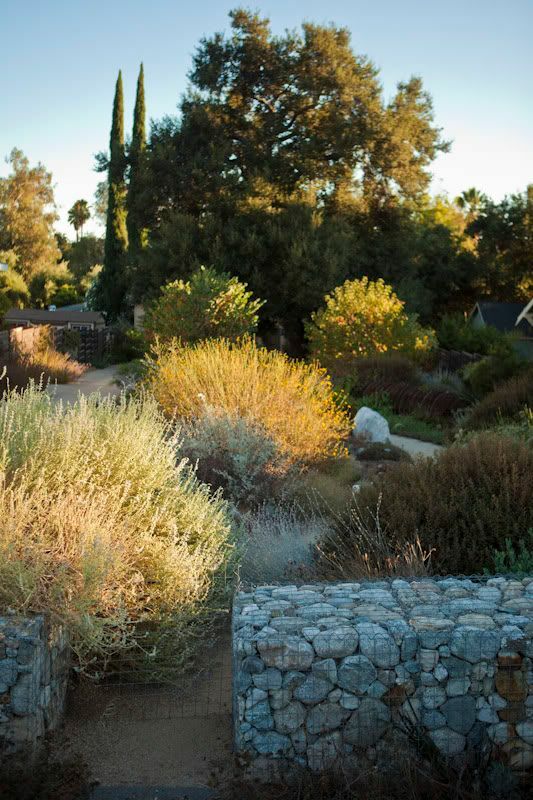 A filtration system, a channel of gravel, limestone, and charcoal, finished with limestone blocks, partially seen at the base of this retaining wall, backed by a Valencia orange tree, runs a short length along this drive to neutralize any heavy metals in the water runoff from the driveway before reaching the vegetable garden at the rear of the long, narrow property. 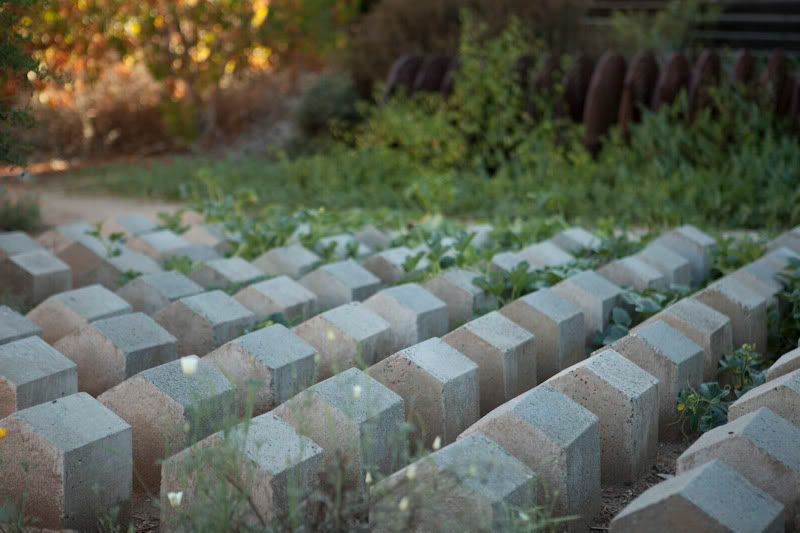 What is referred to as a “site-specific installation” makes reference to the lush orchards and farmland of Los Angeles in the early 20th Century by including these quarry granite polishers, here used to evoke farm combines. This illustrative history depicts the arrival of housing, filling up and displacing the fertile fields and orchards. The garden was brimming with the remnants of past and future projects. Kale and artichokes had just been planted in the vegetable garden that produces year-round. The glinting shade cloth is a material called “Aluminet,” which would seem to have limitless potential for both utilitarian and ornamental purposes. 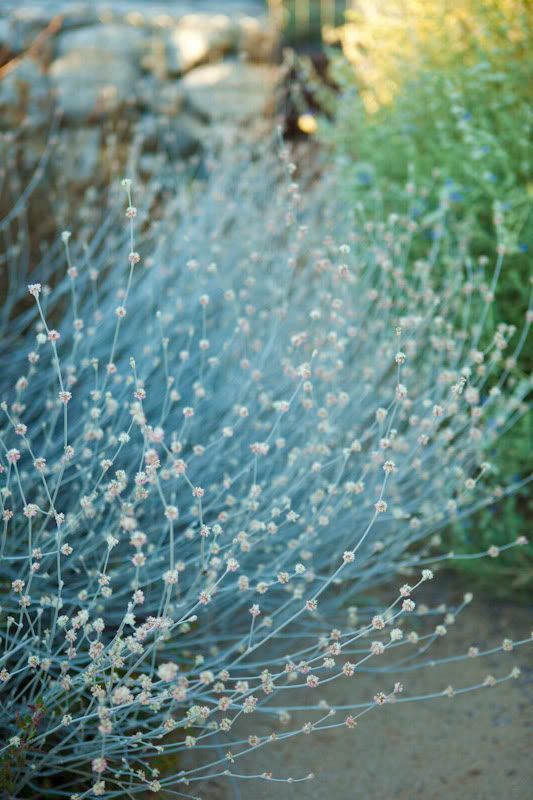 Summer is a period of rest in a Mediterranean landscape, though there was still plenty of shrubby chapparal plants in bloom, especially salvias and buckwheats. 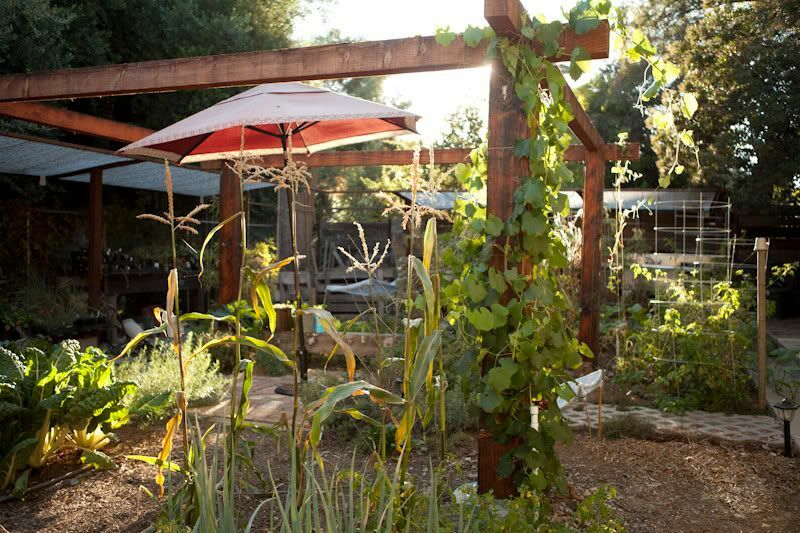 A drip system was still visible above ground, laid down to start the young garden, but once mature, all irrigating is now done overhead, about three to four hours a month, as early in the morning as practical. This was reassuring news, as I was feeling a bit guilty for the light overhead watering I’ve been doing this summer. The intoxicating scents of the plants were released with just a brush of the hand. A view down the central decomposed granite pathway. Mr. Hessing generously chatted with me for a solid hour, answering my questions on plant ID and future plans for his garden, which include installing six water storage tanks, which will be capable of holding almost 700 gallons of water harvested from a little over one inch of rainfall running off the metal roof he’ll be installing soon. The view across the street from the Hessing/Bonfigli garden. Past, present, and future, all in one evening. This entry was posted in garden visit, MB Maher and tagged Andreas Hessing, Andrew McNally, buckwheats, chapparal, J. Krishnamurti, Karen Bonfigli, Pacific Horticulture, Theosophical Society, Wallace Neff. Bookmark the permalink. Good Grief! What a fantastic day you must have had! 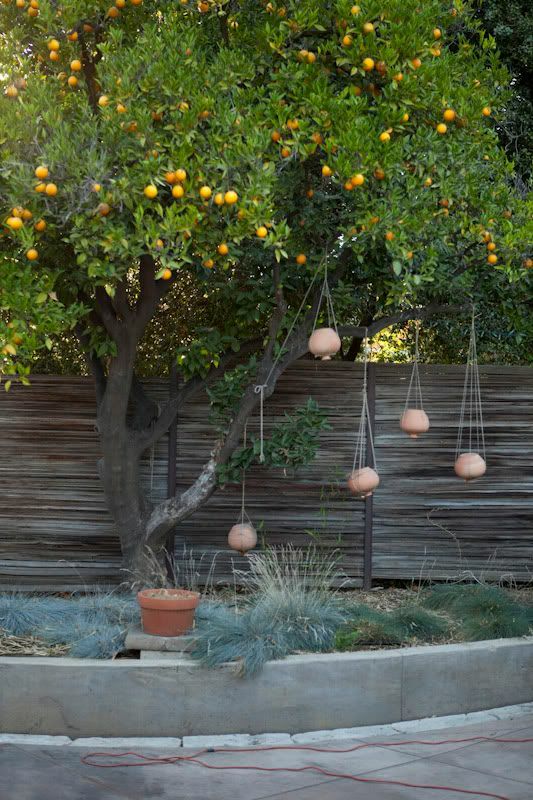 The hanging pottery idea alone is enough to keep my ‘how can I do that’ part of my brain spinning for hours. 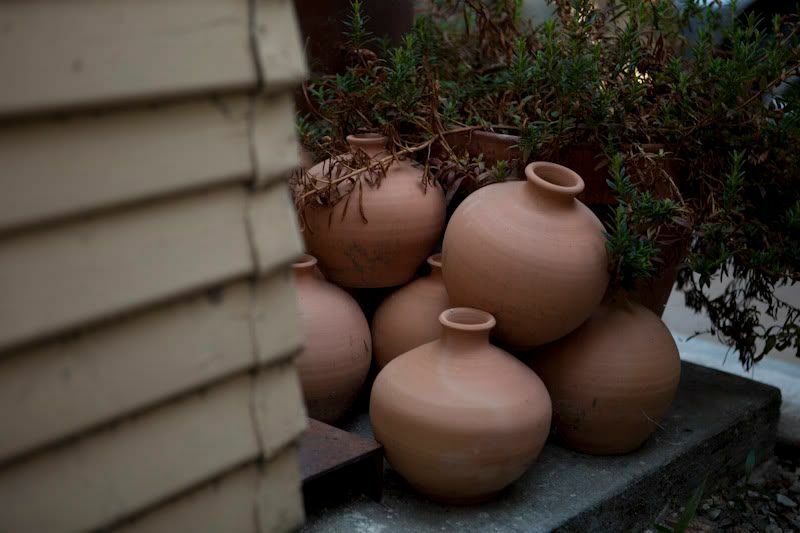 The garden art, the rock fence, the stacked pottery, the designs. I’ve never even heard of the place. So cool that you could share this. 700 gallons! My goodness. I can store about 75 gallons, but I’m adding another 50 gallon tank this Fall. Fortunately, we get about 48 inches of rain a year. But it hasn’t rained in 3 weeks. Go figure. I’m going to backtrack to your foliage follow up this weekend. Alas, I’m back in school as a teacher and today was a 13 hour day up in the room. Summer is over. Boo hoo. Fabulous..folks can verbally trash LA to a fare-thee-well but what a rich history it has-no problem here claiming it as my hometown. 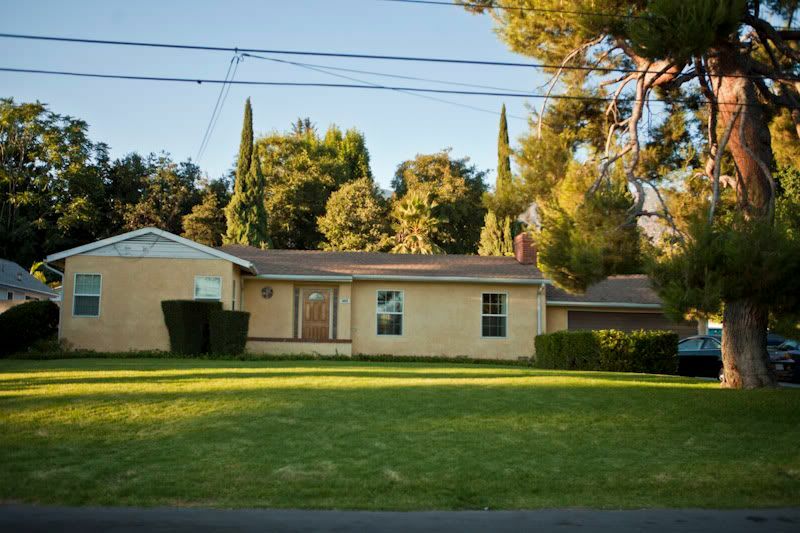 And that last photo…Oy all that lawn ! What I wouldn’t do with that much land-the lawn would be the 1st to go, followed by the front door. We’re working you teachers too hard, David. Glad you found some ideas interesting. Kathy, I don’t get up to the foothills that often. Interesting stuff up there! Sounds like quite an adventure. I love the architecture of the house (the Queen Anne, not the ranch) and the garden art was great. However, I really want to thank you for the link to Maher’s site, what an excellent photographer. 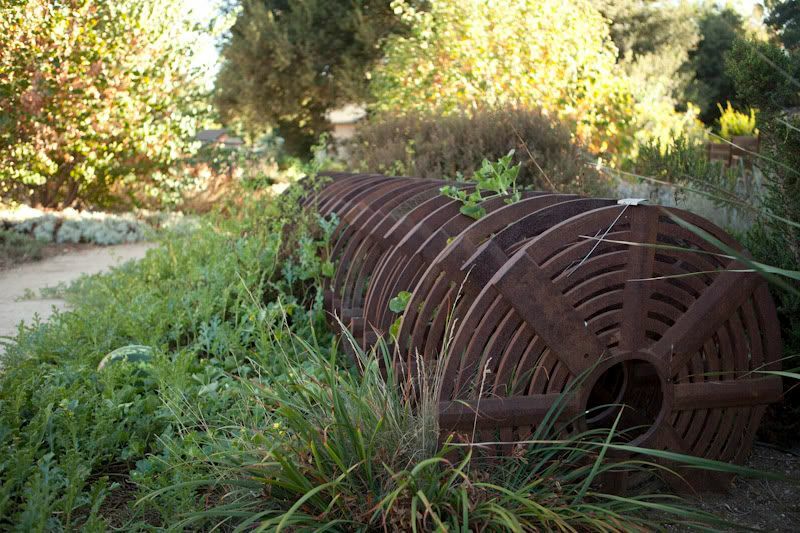 What an interesting dicotomy of past and future garden designs, and eco-systems. 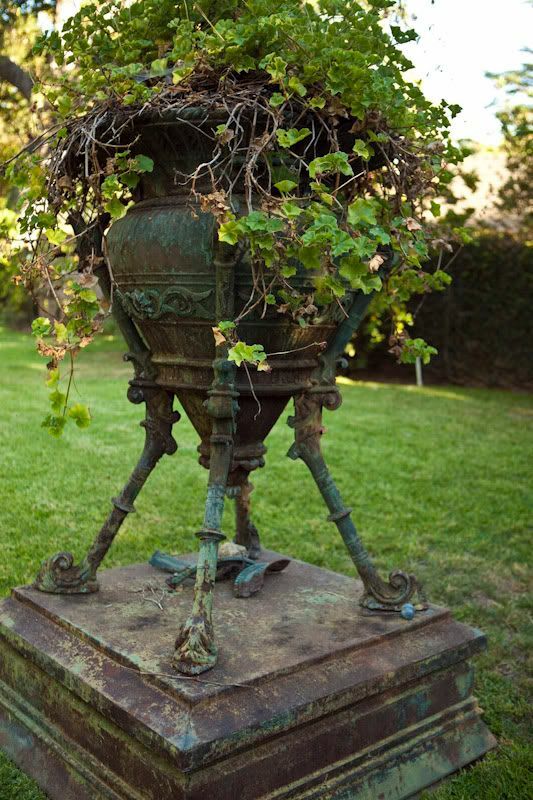 I confess the old one draws me a bit more than the modern one… but I’m a sucker for decaying urns…. Great little road trip, Denise. Me too, Cindy. Someone needs to repro those urns.